Kolhapur, a city in Maharashtra on the western side of India, is popularly known for three things. It is one of the important Pilgrimage site - the Mahalaskhmi temple. Two is a special kind of handmade leather footwear called Kolhapuri chappal and three is their super spicy food. Their famous Mutton Curry is made two ways - one is in white sauce or Pandhra rassa and other is with fiery red chilies called Tambda rassa or red curry. The cooking style is unique as they cook the goat meat with flavorings to make the broth. The meat and broth are separated and individually cooked further and flavored with more spices. 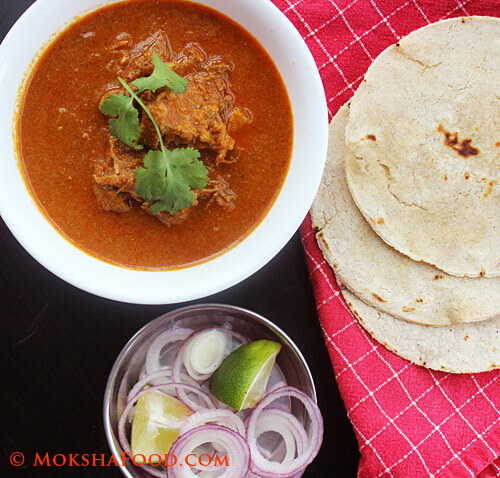 They are then served as a spicy broth, dry mutton curry with sorghum flat breads/jowar bhakris. 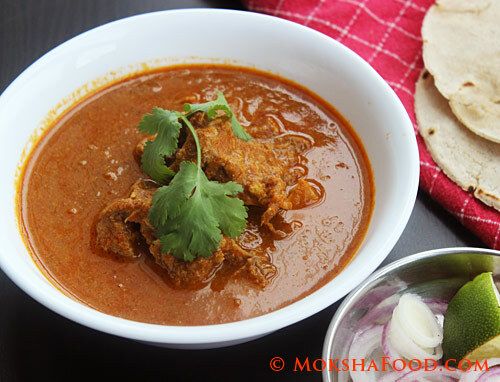 Kolhapuri Mutton Curry is not only very spicy but also uses lot of oil. The broth usually has layer of oil floating on top called the Kat. I have tried to recreate the same flavors with minimal oil. The natural oil releases from the meat, the coconut and sesame seeds is enough to add the additional flavor. The spice level has been controlled to suit our preference. You can add more red chili powder if you like it really spicy. 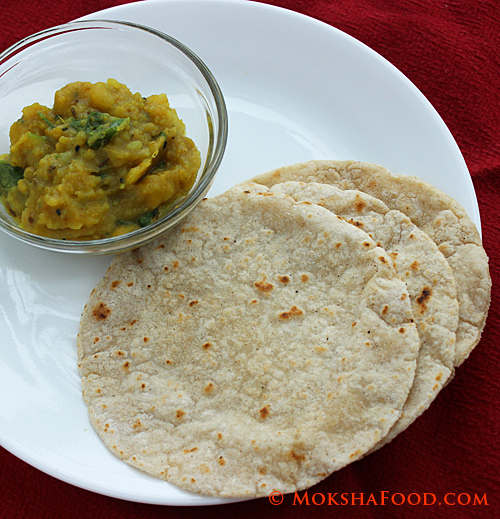 They usually have a special masala called the Kanda lasun masala used. Since I didn't have access to it, I made it with my regular pantry staples. Also I prefer to cook the meat and broth together as a Goat meat/mutton curry and serve with Sorghum flatbreads/jowar chapatis. In a pressure cooker/saucepan, heat 1 tbsp oil. Add chopped onion, garlic, ginger and saute. Add turmeric powder, meat pieces and saute for few more minutes. Pour 2-3 cups of water and cook till almost done. You can do it in a saucepan too but it just takes longer for the meat to cook. Pressure cooker is a faster way of cooking meat. In another pan dry roast cloves, cinnamon and peppercorn. Remove and keep aside. Roast sesame seeds till they change color; Remove. 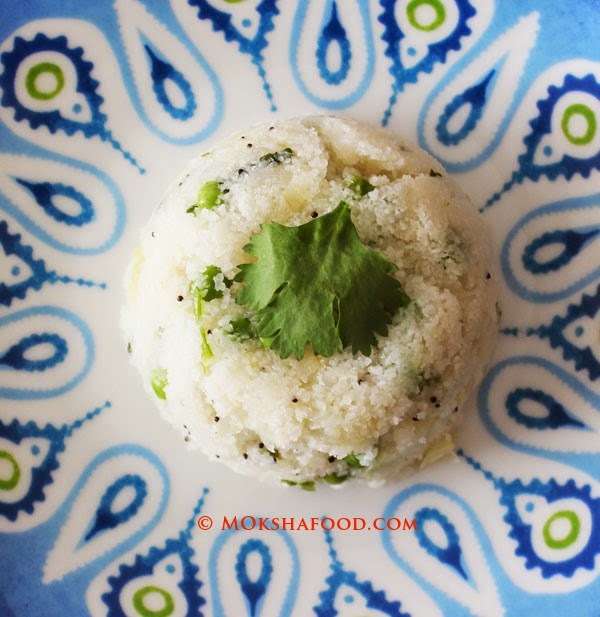 Roast poppy seeds and coconut similarly. Keep aside. Add little oil in the same pan and saute sliced onions till brown. Grind the roast spices with 1/2 of browned onions to fine paste to make Spice Paste1. Grind the rest of the onions with the tomato, rest of the ginger and garlic, coriander and cumin pdr and few sprigs of cilantro to make Spice Paste 2. After the meat is ready, take out the pieces and strain the stock. In the same pressure cooker, heat the remaining oil. Add the first and second spice paste and saute well. Add some of the stock if you feel the spices are burning. Add the deghi mirch/paprika and cook for about 5 minutes. Put a lid as the paste will splatter as it cooks. Then add the mutton pieces and the stock back in and taste for salt. Cook the mutton for another 10 mins. 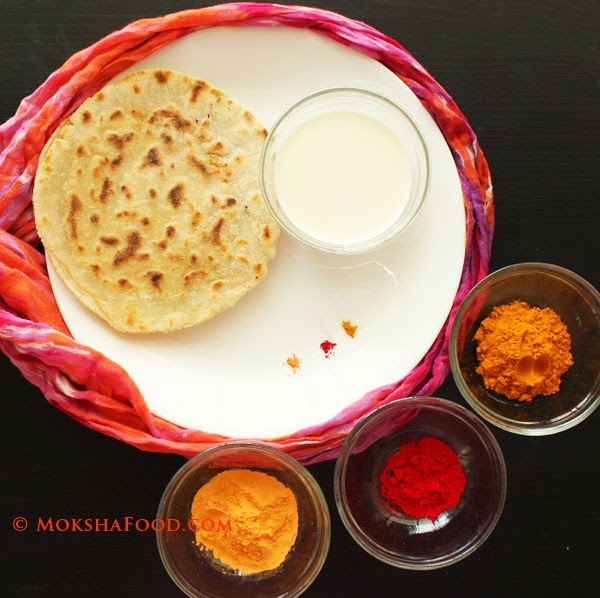 Serve spicy Kolhapuri Mutton with jowar/sorghum rotis/flat-breads.